Ethernet emerged in the 1980s at a speed of 10 Mbps. Speeds multiplied by a factor of 10 several times over a period of more than 20 years, and by 1995, Ethernet had reached 100 Mbps. 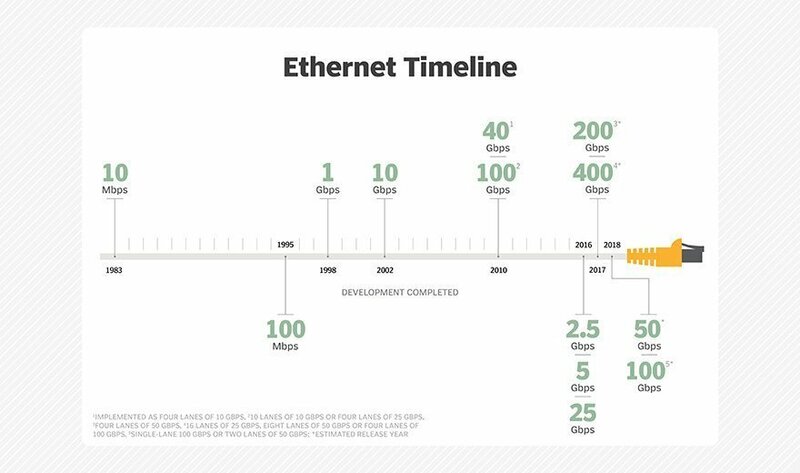 In 1998, Gigabit Ethernet became the standard, and 10 GbE followed in 2002. The Institute of Electrical and Electronics Engineers (IEEE) ratified the faster 40 Gbps and 100 Gbps Ethernet standards in 2010, with 40 Gbps implemented as four lanes of 10 Gbps, and 100 Gbps offering 10 lanes of 10 Gbps or four lanes of 25 Gbps. By 2014, hyperscale data centers were driving demand for next-generation servers and higher-speed networking that would be more cost-effective and power-efficient than the existing options for 40 Gbps and 100 Gbps. The 25 Gigabit Ethernet Consortium -- which includes vendors such as Arista Networks, Broadcom, Mellanox Technologies and Microsoft -- took on the development of single-lane 25 Gbps Ethernet and 50 Gbps Ethernet standards, with the latter based on two lanes of 25 Gbps. Soon after, the IEEE launched its own single-lane 25 Gbps Ethernet effort and individual consortium members provided contributions. The IEEE's serial 25 Gbps Ethernet became a standard in 2016, and the standards body hopes to complete its work on the single-lane 50 Gbps standard in 2018. On the IEEE's roadmap in 2017 is the completion of its 200 Gbps Ethernet standards work, with the technology implemented as four lanes of 50 Gbps. The single-lane 50 Gbps technology will also facilitate a new two-lane implementation of 100 Gbps Ethernet. Aggregating two lanes of 50 Gbps for 100 Gbps Ethernet, or four lanes of 50 Gbps for 200 Gbps Ethernet, offers an IT organization the advantages of reduced cabling and adapter infrastructure, as well as lower power consumption and overall TCO. The IEEE is targeting 2017 to finish off the 400 Gbps Ethernet standards project, with implementation options of 16 lanes of 25 Gbps, eight lanes of 50 Gbps or four lanes of 100 Gbps. Single-lane 100 Gbps is due for release in the first half of 2018. On a separate track, the IEEE developed 2.5 Gbps and 5 Gbps Ethernet standards for LAN networks in response to the bandwidth demand on enterprise's cabling infrastructure spurred by the IEEE 802.11ac Wi-Fi standard. Many organizations that wanted faster Wi-Fi did not want to rip and replace their copper cable infrastructure to move to 10GBASE-T, which requires Cat6a or better cabling. Moving to 2.5 Gbps and 5 Gbps Ethernet -- which became IEEE standards in 2016 -- will enable users to keep the same Cat5e and Cat6 copper cables they used with 1000BASE-T. Some multigigabit switches developed prior to the release of the official standards support 1 GbE, 2.5 GbE and 5 GbE. Why are higher-speed Ethernet technologies advancing at a faster pace than other data storage networking options?